William L. Gaudreau, a leading post-Vatican II architect who designed many churches, school buildings and other structures in the Archdiocese of Baltimore, died July 6 of heart failure at the Gilchrist Center for Hospice Care in Baltimore. He was 84.Known for a modern style that emphasized liturgical function over private devotion, Gaudreau sought to encourage more participation at Mass by incorporating design features such as setting congregations in close proximity to the sanctuary. Many of his designs were simple and clean, with limited use of stained glass or other traditional church adornments. One of Gaudreau’s most daring churches was Our Lady of Hope in Dundalk, an award-winning building dedicated in 1970. Rising 60 feet and spanning some 240 feet in length, the imposing structure is shaped like a colossal pyramid made of dark brick. The interior features an elliptical sanctuary, with the ambo at one end and the altar at the other. Worshippers face each other in sections of pews on opposite sides of the sanctuary. In a 2004 interview with the Catholic Review, Gaudreau said his goal with Our Lady of Hope was to encourage “celebratory, communal worship.” With its sloped seating, the church was intended to be used also for liturgical plays, concerts and other gatherings outside Mass. Although Gaudreau was excited by new expressions of church architecture, Father Leavitt said, he was not ideological and did not impose his views on others. As the son of Lucien E.D. Gaudreau, project architect for the construction of St. Mary’s Seminary in 1929, William Gaudreau had a long association with the Roland Park institution. William Gaudreau was the architect of the seminary’s Center for Continuing Formation and the library expansion that houses the archives of the Archdiocese of Baltimore, St. Mary’s Seminary and University, and the Sulpicians of the United States. He most recently designed the memorial water fountain that greets visitors. Father Leavitt noted that Gaudreau respected the integrity of the seminary’s original design. He helped developed a master plan for the seminary, which the priest said proved invaluable. Among Gaudreau’s other works included buildings for St. Frances Academy in Baltimore, Calvert Hall College High School in Towson, Towson University and what is now McDaniel College in Westminster. Father Leavitt said Gaudreau was very generous, doing pro-bono work for nonprofits and helping with fundraising. He served on St. Mary’s Seminary’s board and was supportive of the Little Sisters of the Poor. “He was a dedicated Catholic and a wonderful family man,” Father Leavitt said. Raised in Park Heights, Gaudreau attended St. Ambrose School in the city and what is now Loyola Blakefield in Towson. He then earned a degree in philosophy from the University of Notre Dame in South Bend, Ind., in 1953. After serving in the U.S. Air Force, he returned to Notre Dame to complete a second degree in architecture. 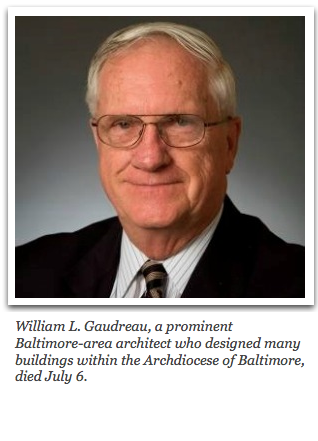 He worked for the architecture firm founded by his father, today known as Gaudreau, Inc.
Over the course of his adult life, Gaudreau was a parishioner of St. Pius X in Rodgers Forge, Shrine of the Sacred Heart in Mount Washington and St. Mary in Annapolis. He lived at Mercy Ridge Retirement Community in Timonium for his last eight years. The father of four children, 12 grandchildren and six great-grandchildren, Gaudreau was predeceased by his wife, Mary Frances Kelly. A funeral Mass will be offered at St. Mary’s Seminary July 11 at 9 a.m.